Christmas preparations can be a fun part of the holiday season themselves. Here are the tasks to do this week to make a Christmas that is stress free, and enjoyable for you and your whole family. 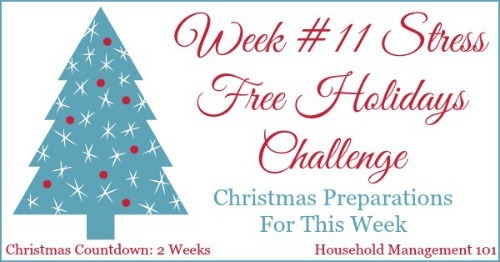 Can you believe we are already on week 11 of the Stress Free Holidays series? Christmas will be here before we know it, and we are coming down to the wire. Here are the Christmas tasks to do this week to get everything ready. For the past few weeks I've been encouraging you to wrap presents as you go, as part of your Christmas preparations. However, if there are a couple that you haven't gotten to now is the time to get this wrapping done. Set aside a couple of hours, perhaps after the kids go to bed, and pop in a movie to watch, or turn on some good Christmas music and get all those presents wrapped and ready to go. You'll thank me later, when things are even more busy and you aren't trying to do this late at night when you'd rather be sleeping. Throughout the series we've had lots of little tasks over the last 11 weeks to get ready for this moment. Now it is time to finish up the last few remaining cards and mail them all out. Since you've got all this extra time this year, and haven't rushed the process along, try to get some cute Christmas stamps for your cards to give them that last, extra special touch. If you have little kids, like I do, your home is probably full of toys, and you'll get more for Christmas. Even if you choose to buy clutter free gifts for your kids, or to do a family gift idea, not all your relatives and friends will. 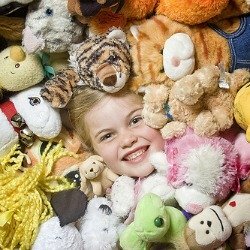 Save yourself a bunch of headaches after Christmas, when you are trying to put all those new toys away, and do a quick clean out of old toys now. In my opinion this is one of the most critical, but overlooked Christmas preparations you can do in your home. This is also a great chance to talk with your kids about donating to others who are less fortunate, and being thankful for what you have. 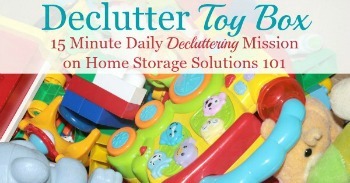 You can get more tips for getting rid of toy clutter here. If you're hosting Christmas parties or celebrations this year go ahead and begin getting your home cleaned up and ready to host those guests without you becoming stressed. 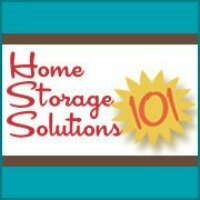 You can reference my housekeeping checklist, which lists the tasks you should focus on for hosting guests, even if your house is currently messy. Be sure to check it out to make sure you're prioritizing properly and get it all done with time to spare. Of course, the Christmas preparations and tasks I give out in this challenge have to be rather general, since they're going to a large group. That means you've got to think about the unique things you need to do too, to get ready for Christmas. With just a couple weeks until the big day now is the perfect time to make sure you think through everything you need to get done. Think of your family's Christmas traditions, and make sure you've got the right supplies, set aside time, or whatever else it is you need or want to do to make those traditions come alive again this year. This is also the time to really think about food for your holiday gatherings and/or Christmas Eve and day. I had you think about these things before, but only you know the specifics of what you have planned to make your planned meals or other food. Once you've made your personal to do list look at it critically. Think through all the steps in the tasks you need to accomplish and make sure you haven't forgotten one. Then, look at the list critically again, and make sure you actually have the time and energy to get all these things done in a stress free, relaxed way. If not, cut some things out, delegate them, or make your plans less grand. This is not the time of year to be working yourself ragged, so make sure what you plan is realistic, and gives time for fun and time with your family. That is where you find true fulfillment during the holidays anyway. 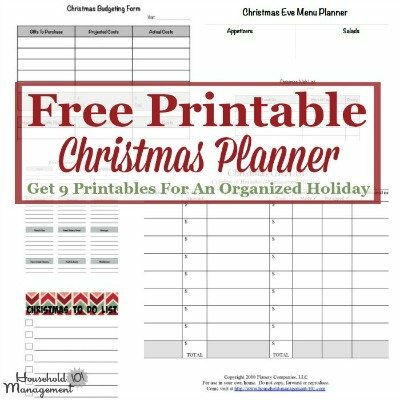 Get Your Free Christmas Planner Here! Along with the Christmas printables listed above, I've got even more here on the site! I've rounded them all up (9 printable forms) into one spot for you here, so grab all your Christmas planner printables here. I'd love to hear how this week's challenge is going for you, so make sure to share with me below in the comments. You can share what you've accomplished, or any set backs you've had so we can all cheer you on. If you missed the previous parts of this series, you can still jump in. 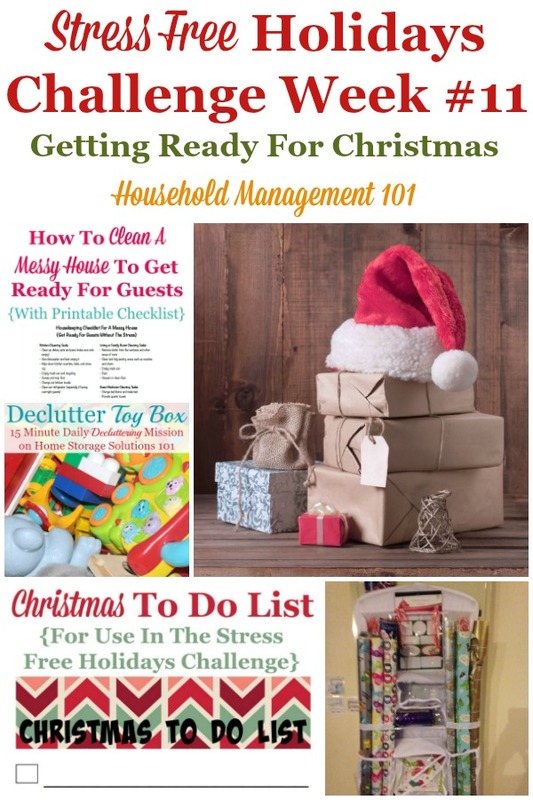 There is always time to start your Christmas preparations to make your holidays stress free.